Bareknuckle is a pretty aggressive moniker for a pocket knife, referring to a fist fight sans gloves – an “only real men” kind of thing. You go bareknuckle to settle a dispute like it’s the wild west, punching someone in the face knowing it’s gonna hurt them, but it’ll hurt you more as well. 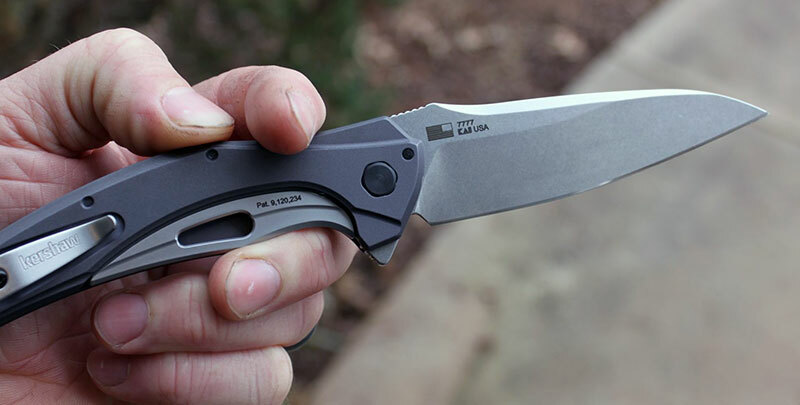 I gotta be honest, at first it was a fitting name for the knife – we’ll get to that in the “deployment and lockup” section – but the longer I carried the Bareknuckle the more I wondered what was so “bareknuckled” about this extremely useful and likable pocket knife. But first, a little background, because the story behind the Kershaw Bareknuckle (model 7777) is somewhat circuitous. It is itself a variant of the Natrix line of knives, but made in the USA and slimmed down and upgraded with better steel and aluminum handles. The Natrix, which is an imported product available in three sizes (regular 3.25”, XL 3.75” and a Mini 2.75”) are themselves derivatives of the Zero Tolerance 0770, which is based on the 0777 flagship knife that won Knife of the Year at Blade in 2011. Kershaw details the relationship in this helpful blog post. They all share a visual similarity that’s readily apparent, as well as the unique Sub-Frame Lock design, but the Bareknuckle is stretched out (3.5” blade and 8.2” overall, versus 3.25” and 7.5” for the Natrix) and slimmed down top to bottom. It also swaps out Kershaw’s Speedsafe torsion bar assisted opening for a KVT ball bearing pivot. A number of other details elevate the Bareknuckle above the rest of the Natrix line, and it’s also made in the USA – which is a big thing for some people. Let’s take a look at the 7777 and see if it really goes Bareknuckle on the competition, or if it’s more of a limp wrist open handed slap. The 7777’s blade is a modified drop point shape, measuring 3.50” long and cut from reasonable 0.12” blade stock. It has a long false swedge along the spine that leads to a thumb ramp with a row of jimping for grip. The blade is flat ground fairly high up, with the plunge line intersecting the edge well behind the sharpening choil, leaving no “beard” to worry about when you touch up the edge. The edge has an interesting profile – the leading portion having an almost concave appearance due to the shallower curvature compared to the back of the edge. It looks strange but it works in practice, giving you a mix of belly for roll cuts and straighter edge for slicing. The blade has an attractive stonewash finish that’s evenly applied if a bit flat. The Bareknuckle uses Sandvik 14c28n stainless steel, which was actually a design collaboration between KAI (parent company of Kershaw) and Sandvik steel in Sweden, designed to be “the best performing stainless steel that’s still fine-blankable” – meaning the blank shape of the blade can be made in a single step with a dedicated press, saving cost on tooling and manufacturing. 14C28N is comparable to CTS-BD1 and maybe a half-step below VG-10 in terms of performance, having a bit less carbon content (.62 versus .95-1.05) but similar chromium. It does include a bit of nitrogen for additional edge retention. Compared to a higher performance steel like Crucible S30V, it has a bit more than 1/3 the carbon content and no molybdenum, tungsten or vanadium. It’s an improvement over budget steels like 8Cr13MoV, AUS-8 or earlier Sandvik steels like 12c27 and 13c26. This has been a contentious topic among people that have gotten a Bareknuckle in hand. When this knife first arrive, it had a detent so stiff as to almost be unusable. We’re talking RJ Martin custom knife stiff detent, which lead to a pretty painful finger pad from flipping it the first few days. I discovered that the Bareknuckle suffers from the same malady that many framelock flippers do – the natural position of your hand when you’re opening the knife puts your middle and ring finger on the lock itself, adding additional detent tension and making the knife basically impossible to open. Correcting your technique still leaves you with an extraordinarily stiff detent. I carried the 7777 for a few days and had to put it back on the shelf for almost a week while my finger healed up from the beating it received from this monster detent – and I’m a person that has been habitually flipping knives hundreds of times a day (ask my wife if you don’t believe me!) I almost wrote this one off as another flawed Kershaw product – great concept, garbage execution. But then it started to feel like something was stuck in the pivot, so I took the knife apart and cleaned out the bearings and tracks, as well as cleaned and lubricated the detent path and things started to get better. Then, one day, it just magically broke in. After a few weeks of carrying (admittedly a very long break-in period) the action on my Bareknuckle is nearly perfect. The detent is still stiff, but more in an “enthusiast preference” level of stiff rather than “finger injury” stiff. The Bareknuckle rides on a KVT ball bearing pivot, stainless bearings in a brass cartridge with stainless washers in between the aluminum handles and the bearings to prevent wear and galling. Like most other bearing pivot Kershaws, it is sublimely smooth. It’s much more satisfying than the Atmos which uses a plastic bearing race and has a very light detent – but it’s also more than twice the price. It doesn’t quite drop shut due to tension on the side of the blade from the detent ball, but the older I get the more I realize that’s safer anyway. Maybe we’re getting jaded because these days almost everything that comes out flips well, but the Bareknuckle was still the best flipping knife I handled in 2018. The lock is interesting, too. It’s a Sub-Frame Lock (or SFL) which is a unique design that KAI owns the patent for (US #9,120,234, etched on the lockbar itself if you forget!) and it’s sort of a cross between a liner lock and a frame lock. It bolts to the handle itself on the inside and the handle is cut away to reveal it – which is highlighted by the contrast between the grey handle and the silver lockbar. It functions similarly to a framelock, and even includes an integrated overtravel stop on the inside to prevent hyperextending the lock and creating metal fatigue. Lockup is perfect – no horizontal or vertical blade play at all, and the lock engages fairly deep – around 70% engagement. I noticed slight lock stick on occasion when flipping the knife particularly hard or after extended use with the blade open, but nothing severe – as a concept it’s well executed and nice to look at to boot. The Bareknuckle uses an external stop pin to locate the blade in the open position. The Bareknuckle is loaded with features and small details that elevate it from most of the rest of the Kershaw line. The big feature is the anodized aluminum handles – which Kershaw also uses on their Launch line of automatics – with a handsome matte grey anodization. The contrast between the handles and the silver lockbar add some visual interest. Milling on the handles is extensive, with fully radiused edges and a raised center section that keeps the knife comfortable in hand. The inner edge of the subframe lock also has a concave section making it easier to release, and there’s a small window in the lock bar – the purpose of which isn’t entirely clear. One thing the Bareknuckle doesn’t feature is extensive packaging – it’s just a cardboard box just large enough to fit the knife, a plastic sleeve, and a folded up piece of literature. Compared to some brands like James or Kizer who spend a lavish amount of money on packaging, the simple packaging on Kershaws is refreshing – you know that’s money they can then spend on the knife. Exorbitant packaging has always confused me – my interest in it lasts until I have the knife out, and then I place the packaging in my closet forever. Construction consists of a Chicago screw-style pivot with a hex head set into the lock side to locate the pivot, and a large decorative pivot on the show side. Three full-width screw pass through the show side and thread into the lock side, and two more screws pass through the lock side to hold the lock bar in place. The backspacer is neat – it’s been hollowed out to give it a floating appearance. Unusually, there’s no lanyard tube despite the size of the knife. The pivot uses a Torx T8 and all the body and clip screws are Torx T6. The pocket clip is a deep carry loop-over style spring clip secured with two vertical screws, configurable in ambidextrous tip up carry. 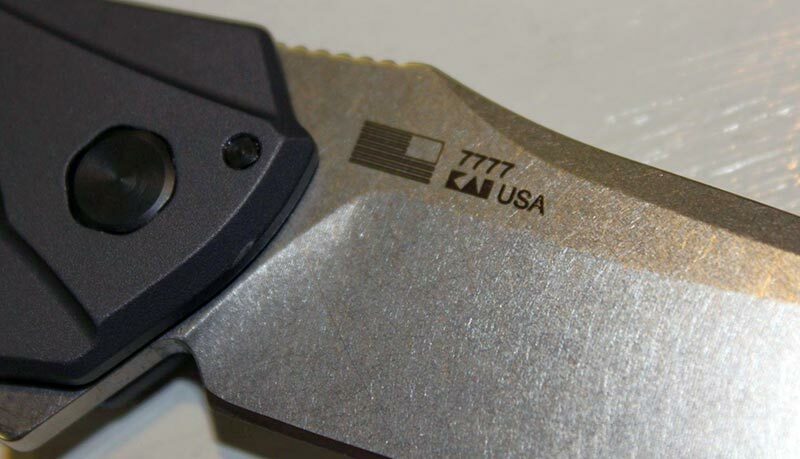 The USA-made nature of the knife is emphasized in the official description, so it makes sense that Kershaw etched a small American flag on the lock side of the blade, same as with the Link and Dividend. 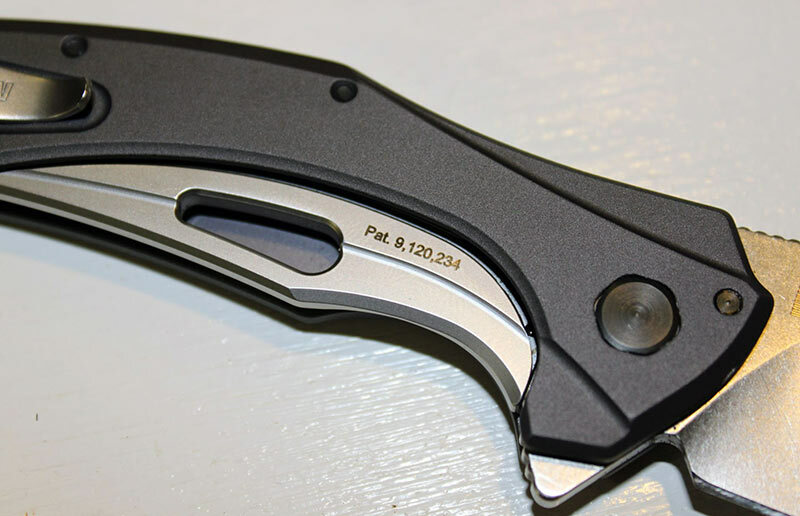 The model number and “KAI USA” are etched next to it, and “Kershaw” on the opposite side. The only jimping on the knife can be found in two places: on the forward edge of the flipper tab, and on the thumb ramp at the rear of the spine – realistically the only places it’s needed. Fit and finish on my example was good, with no issues noted and all the standard things one checks for passing – the blade is centered when closed, none of the screws stand proud of the handles when tightened down, the primary and edge bevels are even to the naked eye, the anodized finish is smooth and even, all marks and etching are clean and legible. 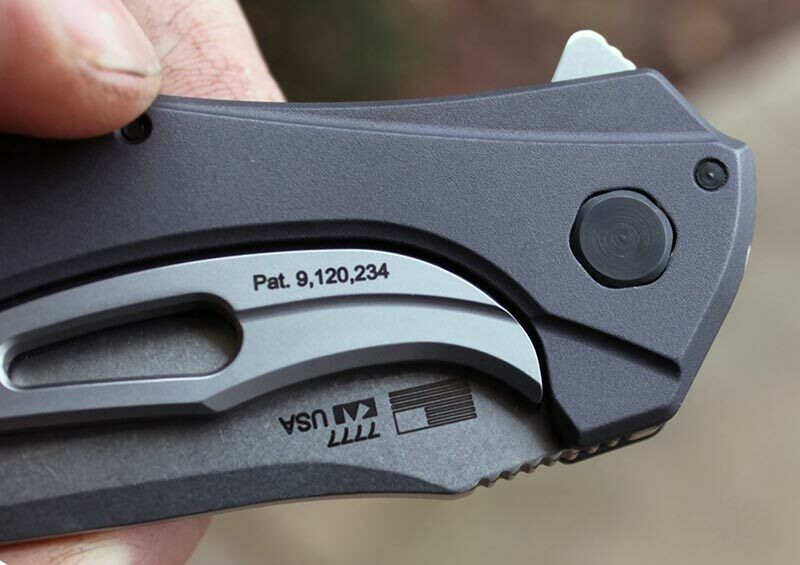 This is a well-made knife, which is par for the course with US-made Kershaw and ZT products. I carried the Bareknuckle exclusively for almost a month before I started this review – and carrying only one knife for a month is a pretty strange circumstance for me. Now, to be fair, this is partly because the rest of my toys knives were packed while my wife and I moved, but also because I wanted to use and get to know the Bareknuckle over this period. There’s no better way to get to know a knife than to use it while you pack, move, and unpack. Cutting tape, breaking down boxes, opening packaging, peeling up the leading edge of packing tape, popping zip ties, the kind of stuff that a good EDC knife should make feel less like work. The Bareknuckle makes an excellent EDC provided you’re OK with the larger size. The blade came quite sharp (again, normal for Kershaws both domestic and foreign in my experience) and the reasonable blade stock and high flat grind make it adept at minor food prep or slicing up apples too. The shape of the blade means it has a fairly acute tip, but not prone to snapping like on the Leek, so the Bareknuckle is good at piercing hard packaging too. It’s really an excellent tool for day to day tasks, and while I tend to prefer sub-3” blades for daily use, the size of the Bareknuckle never felt unwieldy. Ergonomics are decent but nothing spectacular. There’s no forward finger choil to choke up on, but the thumb ramp on the spine is just right and the flipper tab provides a good finger guard when open. The slightly recessed clip is hardly noticeable in hand, but the handle itself is almost too slender considering the size of the knife, with a bit of empty space under your ring and middle fingers in a full grip. Of course, this slender nature is the reason the Bareknuckle carries so well. For a knife that stretches out almost eight and a quarter inches when open, the 3.5 ounce weight is impressive – especially considering that the lockbar is a full width chunk of steel and the knife has bearings. The clip is a mixed bag – it feels good in hand thanks to the recessed pocket it rests in, but it’s a bit on the short side relative to the size of the knife, and the Bareknuckle moves around in the pocket as a result. Its slim shape and low weight overall means it carries well. Apparently the longer clip from the Link and Dividend will also fit the Bareknuckle if you want the added stability. Now we get to what’s not so great: the blade steel and the pivot. First, the blade steel. For a knife that retails at $70, Sandvik 14C28N is… okay. It’s not a constant sharpening party like it would be with, say, 8Cr13MoV or AUS-8 or 420HC, but this isn’t a high performance steel. Some competitors in this price range (or below this price range) offer better performing blade steels. I found the edge had a tendency to roll rather than chip (admittedly, I’d prefer it that way) and after profiling it to 20 degrees on a Lansky I did frequent touch-ups on the fine stones of my Sharpmaker to keep it “paper slicing sharp.” If they make an upgraded version of the Bareknuckle in something like CPM-20CV or Bohler M390, it would be an instant buy for me. As it is, I like a better performing steel for the money. It is fairly easy to sharpen, of course. The big problem with the Bareknuckle, and indeed with a fair number of Kershaw products past and present, is the pivot. It should work in theory: the Chicago screw has a hex head on the lock side that sits in a matching hex slot, which prevents it from turning when you’re loosening or tightening the pivot from the other side. In reality, it doesn’t – the amount of thread locker on the pivot combined with the soft aluminum handles and loose fitment of the pivot means the hex head will turn in the handle and round out the aluminum, effectively ruining it. Thankfully mine only turned to the point of bothering my OCD, but I haven’t been so lucky in the past – I had this same problem with the original orange G10 Zing around ten years ago, where the hex head totally rounded out the softer G10 handle scale, and I wasn’t able to loosen the pivot or disassemble the knife. I’ve heard anecdotal evidence that says the ZT 0640 suffers from this same problem as well. While the hex head is a neat concept, a D-shaped pivot tube is probably simpler and works better. Or just put a torx fitting on both sides. This is a bummer because I found myself needing to frequently take the Bareknuckle apart to clean gunk and lint out of the bearings once I started hearing gritty noises from the pivot, a common issue with knives using bearings. If you’re not extremely careful you could round the hex fitting out on the handle rendering it useless. If they fixed this issue it’d be a nearly perfect EDC knife. At $70 retail there are a number of alternatives to the Bareknuckle that all offer a variety of different options to entice you. The Kizer Begleiter springs to mind. Like the Bareknuckle, it also has a slim 3.5” blade and handle. It uses VG-10 steel, which is slightly better performing than 14C28N, but it doesn’t have the bearing pivot or flipper that the Bareknuckle does. Textured G-10 scales cover a stainless liner lock, and the Begleiter retails for about $60. WE Knives’ new budget brand Civivi is hard to pronounce but easy to love, offering the exceptional build quality WE is known for at a more reasonable price point. The Civivi Aquila retails for about $70, and like the Bareknuckle it uses a bearing pivot and a flipper for deployment. It has G10 handle scales over funky gold liners, and unusually at this price point it has a milled titanium pocket clip too. VG-10 blade steel is good for this price, and the Aquila has similar dimensions but is a bit heavier than the Bareknuckle. Brous blades used to occupy the midtech price range of the knife market, but has recently branched out into the budget world with a line of imported knives. Ironically, they use the same steel as the regular Brous knives (D2) so for the $50 retail price they offer good performance. The import line Brous Division is only $50 (compared to the real thing at around $350) and offers a bearing pivot and a deep carry clip. It’s pretty heavy at 5.9 ounces, though. People tend to give Cold Steel a lot of grief for their “mall ninja” aesthetic while conveniently ignoring that they make some really excellent knives. If you’re looking for an aluminum handled 3.5” knife around this price point, the super slim Code 4 runs $75. And while it doesn’t have the slick bearing flipper opening of the Bareknuckle, it does have the ultra-stout Tri-Ad lockback and CPM-S35VN blade steel. It’s also available in clip point, spear point or tanto blade shapes depending on your preference. Finally, the CRKT Crossbones we reviewed last year is intriguing. It’s ultra-thin and pocketable, like a folding letter opener. It has AUS-8 steel which is a step down, but the intricately machined aluminum handles and snappy IKBS pivot make it a charismatic choice. It’s an interesting product from a company more known for making budget friendly user knives, but it’s a fun little pocket knife. It’s also extremely light at 2.4 ounces. The Kershaw Bareknuckle looked like an absolute home run when it debuted at SHOT Show last year, and I sat around on pins and needles waiting all year for it to be available. The long lead time can sometimes create unrealistic expectations for a highly anticipated product – remember Duke Nukem Forever? But the Bareknuckle (for the most part) didn’t disappoint when it arrived, pushing everything else out of my carry rotation for quite some time – a rare feat. I like that this feels like a return to form for Kershaw from ten years ago. Newer Kershaw products have catered to the lower end of the market – probably because they sell better in big box stores, and create more differentiation from the increasingly high end ZT brand – but a solid low-mid range knife is rare these days, with little in between the FRN/8Cr13 knives for $30 and the $150+ high end options. Kershaw used to dominate this market, with fascinating knives like the Mini Cyclone and the Groove. The Bareknuckle has all the stuff that knife enthusiasts like – sleek looks, manual action, smooth bearing pivot, unique design, US-built, etc – but at a reasonable price. It’s a great cutter and a killer flipper, with only a few flaws. I do wish Kershaw would fix the pivot issue, and while I get the correlation between the price and the steel, I (and I think a lot of other people) would think this knife is a greatest of all time kind of knife if it had M390 and a $100 price tag. Hex head pivot tube spins in the handle causing gradual self-destruction, too much Loctite, steel performance, initially VERY hard to flip. Kershaw lands back in the market as the proverbial gun in the knife fight. It’s so good it’s almost not fair.